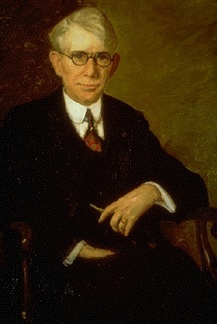 Governor Emmett F. Branch, Governors’ Portrait Collection, accessed Indiana Historical Bureau. Emmett Forest Branch may have only completed part of a term as Governor of Indiana, but he worked continuously for the people of the state. He constantly urged them to have faith in the Republican policy of “expansion of the agencies of government necessary to meet the requirements of the population.” By this, he meant improving schools, roads, and care of the state’s wards. As lieutenant governor and governor, Branch advocated specifically for these reforms. Born in Martinsville to Elliott Branch and Alice Parks in 1874, Branch attended Martinsville High School and graduated from Indiana University in 1896. Branch’s father possessed a unique sense of humor, naming his children Olive, Leafy, Emmett Forest, and Frank Oak, to create his own family “tree.” Branch inherited this humor, inserting jokes into stories he shared. 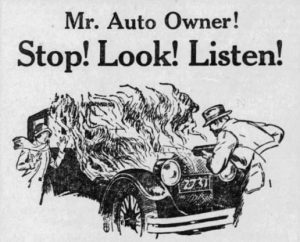 One story in particular went the twentieth-century version of “viral,” and was printed in newspapers across the country. In this story, Branch recalled one of his walks while in cadet school. He came across a man in need of money. Sure that he did not have a cent on him, Branch told the man he could have any money found while turning his pockets inside out. A silver dollar fell out, and Branch returned to his room confused. He later found out that he had worn his roommate’s pants by mistake. The time is past when the people should be taxed to further the rich corporations because the latter are now in a condition to care for themselves. He also introduced legislation to make automated voting machines mandatory in an attempt to solve the problem of vote-selling and vote-buying, abolishing election frauds and election contests. During his 1907 term, he served as Speaker of the House. As speaker, Branch supported temperance reform, especially the local county option bill, which allowed each county to choose whether they should be a dry county. After his speakership, Branch continued to practice law in Martinsville. Once the United States entered World War I in 1917, Branch again enlisted, serving as colonel in the 151st United States Infantry. “Republican Candidates,” Brazil Daily Times (Ind. ), October 15, 1920, 4, accessed Newspapers.com. In 1921, Branch was sworn in as lieutenant governor under Governor Warren McCray. His first act as lieutenant governor was to end the practice of “omnibus bills” in the Indiana legislature. This practice was used to vote on several bills at once. Branch is quoted saying “It is what I would call ‘guessing them off.’ Gentlemen, guessing off law that is to be fastened upon the people of Indiana is not right.” He closed with another statement: “We should first take care of the unfortunates in the institutions and then put Indiana where she belongs in the educational world.” Later in 1924 while discussing taxes, Branch asserted that, “You cannot have better roads, better schools, better teachers and better care of the unfortunates unless you pay the price.” These two statements encapsulate the position that Branch took as a Republican lawmaker toward improvements in the state. 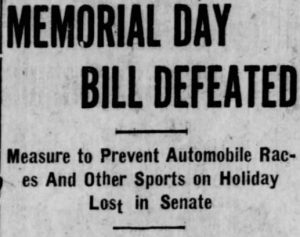 “Memorial Day Bill Defeated,” The Daily Republican (Rushville, Ind. ), January 26, 1921, 1, accessed Newspapers.com. The second issue that arose was the repeal of the 1919 anti-German language laws, passed in part because of World War I. Representative Waldemar Eickhoff introduced the bill in an attempt to remove discrimination against the German language. The bill eventually passed, but not without a rider attached to it that prevented “the teaching of any foreign language, including Spanish, Latin, and French.” The discussion of this bill became so intense that Branch broke his gavel on the podium trying to restore order. The Indianapolis News, April 29, 1924, 1, accessed Newspapers.com. Scandal hit the governor’s office in April 1924, when McCray was convicted on charges of “using the mails in furtherance of a scheme to defraud [his creditors],” and resigned from office. 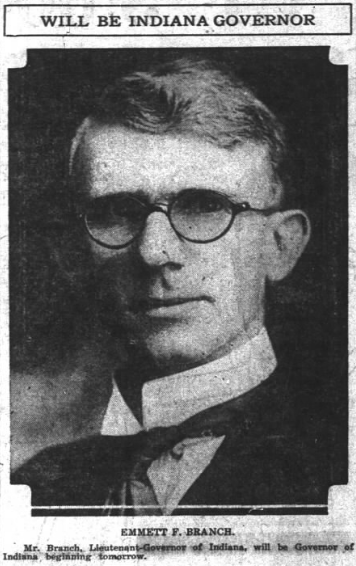 Branch became Governor of Indiana on April 30, 1924 as soon as McCray’s resignation became official. He was the first alum of Indiana University to become governor. With the little time that he did have in office, Branch attempted to build upon McCray’s goals. But before he did this, he had to investigate the administration to ensure that McCray had not involved or compromised the government. He ensured that all departments under the control of McCray were investigated before proceeding as governor. “Will be Indiana Governor,” The Indianapolis News, April 29, 1924, 1, accessed Newspapers.com. Muncie Evening Press, December 12, 1925, 10, accessed Newspapers.com. In October 1924, Governor Branch called a statewide safety conference to see what could be done to lessen the number of people being killed at railroad grade crossings. He hoped that in doing so it would save lives. Branch ensured that all delegates at the conference represented all interests in the subject—railroads, automobile clubs, etc. In his message to the Indiana General Assembly in 1925, he reported the solutions found by the conference members. Branch suggested creating a department of safety. The public service commission should be given the “power to require railroad companies to install and operate flash-light signals, signs, or other modern signal devices at railroad crossings over highways in the country.” Other suggestions included enacting a safety zone and a “Stop, Look, Listen” law to be enacted. Along with this, he was actively involved in extending the state highway system, believing, like many Republicans, that improved transportation would improve the economy. 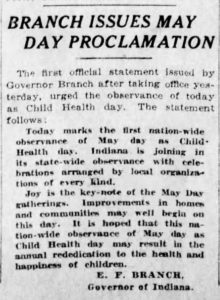 “Branch Issues May Day Proclamation,” The Indianapolis Star, May 1, 1924, 1, accessed Newspapers.com. Support of children’s health was not his only concern—he also continued McCray’s efforts for a new state reformatory at Pendleton and relocation of the Indiana School for the Blind. He defended both of these decisions in his speech at the Republican Convention in May 1924. He encapsulated the speech in a pamphlet titled “The Truth About Your State Government,” in which he discussed the purchasing power of the currency and what taxes pay for in the state. He asserted that the Republicans took over the reins of government from “the most incompetent, inefficient and costly” Democrats in Washington and had been working to reverse the problems they caused. While this seems rather blunt, Branch explained how money was being spent and where in terms that non-politicians could understand. He ended his pamphlet on a good note by stating why he has faith in the people and in his party. Indiana Bell Telephone Company Equipment Truck No. 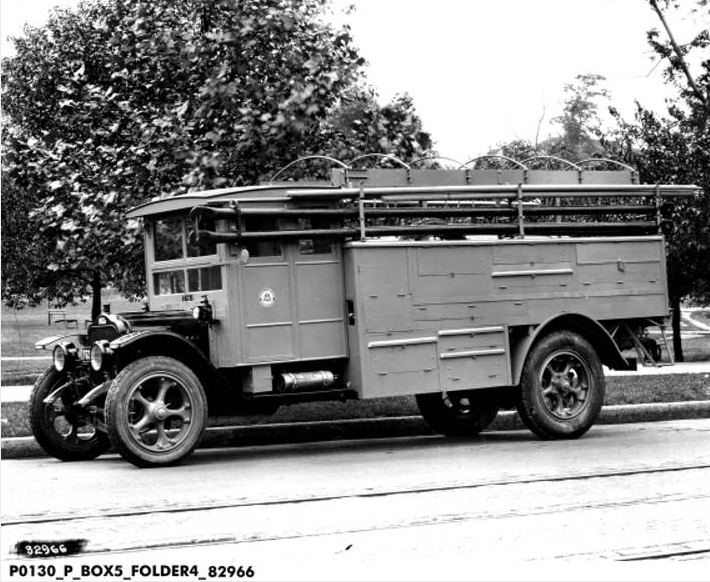 467B, 1923, courtesy Bass Photo Collection, Indiana Historical Society. Unlike his predecessor, the most scandalous thing that Branch dealt with was the Indiana Bell Telephone Company’s attempt to force higher rates on customers without the approval of the public service commission. Branch “demonstrated his willingness to ‘go to battle’ for the rights of the people,” gaining more support as governor from the citizens of Indiana. During a speech before the Indiana Republican Editorial Association, Branch asserted that “as long as he was Governor the Governor’s office and all other state departments would be found fighting for the interests of the people ‘against this monopoly.’” In 1925, this issue gained the majority of attention in discussing the high points of his term. A fan of Abraham Lincoln and proud Republican, he often reminded people that the former president once contended “The Republican party is good enough for me” and that “What was good enough for Lincoln is good enough for me.” In an article published upon his death, Branch is described as “austere and dignified, with a Lincolnesque face,” a description he would have loved. After leaving office, Branch retired with his wife, Katherine Bain Branch, to their home of more than twenty years at 510 E. Washington Street in Martinsville. He practiced law and continued to serve as president of the Branch Grain and Seed Company. Branch died unexpectedly on February 23, 1932 at the age of 57 in Martinsville.